The holidays are fast approaching and we have a series of posts coming to you that involve good gift ideas for the adventure traveler, national park enthusiast, city/small town traveler, international traveler and photographer in your life! 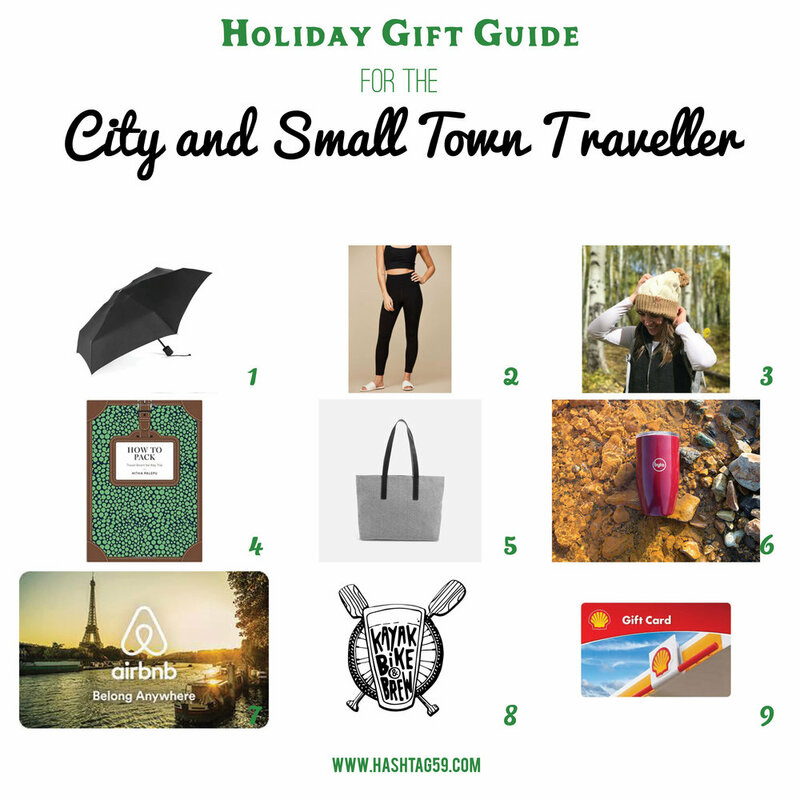 Next up is our list of ideas for the City and Small Town Traveler in your life. 1. Foldable Umbrella: Who hasn't been caught out in the rain without an umbrella and has to settle for a crappy one that will break in the wind? This one is small enough to fit into the smallest of purses or travel packs! 2. Girlfriend Collective Leggings: This is a fairly new company who created a buzz when they offered their yoga pants to the world for the cost of shipping them from Vietnam for $25. They also make their leggings from recycled bottles and pay their workers a fair wage. Since then, they have taken off and I wore mine throughout my trip to Iceland, on hikes in the Rocky Mountains and also to actual Pilates class! They no longer offer the leggings for $25, but they are still a great deal for $70. 3. Among the Wild Beanie: Perfect for both trekking the streets of Denver and then taking hiking! 4. How to Pack Book: This is for the traveler who is never really sure what to take with them. It offers specific things based on where you plan on travelling! 5. Travel Tote: Perfect as a carry-on to the plane to then use as a shopping bag when walking about the big city! My preferred tote is a leather one from Madewell, but I also own the Everlane canvas one, which also looks nice! 6. Byta Stainless Steel Cup: Perfect for a road trip! It is BPA-free and allows you to stop throwing away so many paper cups and plastic bottles! 7. AirBnB Gift Card: AirBnB is pretty much found everywhere these days (not so much when I signed up in 2011!) and is often cheaper than staying in hotels. 8. Tour Adventures: There are so many options for tours in cities and small towns, a few that we would recommend include the Columbus Food Adventures and Kayak, Bike and Brew in Traverse City, Michigan. Get creative and find some experiential gifts to give this year! 9. Gas Cards: Perfect for the road trip warrior!